Bookshop themes has been purchased 50, rating: 4/5 based on 4 reviews. 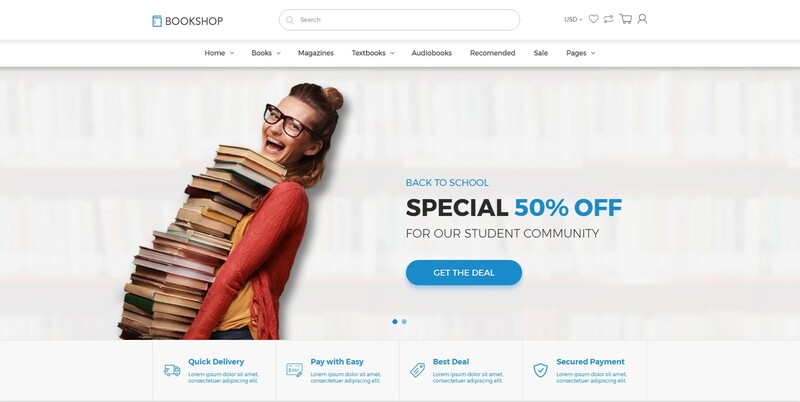 Bookshop is a Shopify topic that is designed by Arenatheme. This theme can fit many types of stores such as fashion, books, courses, technology, games, computers, watches, apparel, etc. In addition, Bookshop is completely responsive on all devices such as tablets, personal computers, mobile phones, etc. Developed based on CSS 3, HTML 5 and Sass CSS technologies, this is the reason for increasing the user experience for customers and improving revenues for the company. This is a beautiful and eye-catching theme, it comes with tons of powerful modules like Blog, Mega Menu, Quickview, Revolution slider, etc. In addition, Bookshop is a customizable Shopify theme and easy to use. This is a great opportunity for you to grow your business.